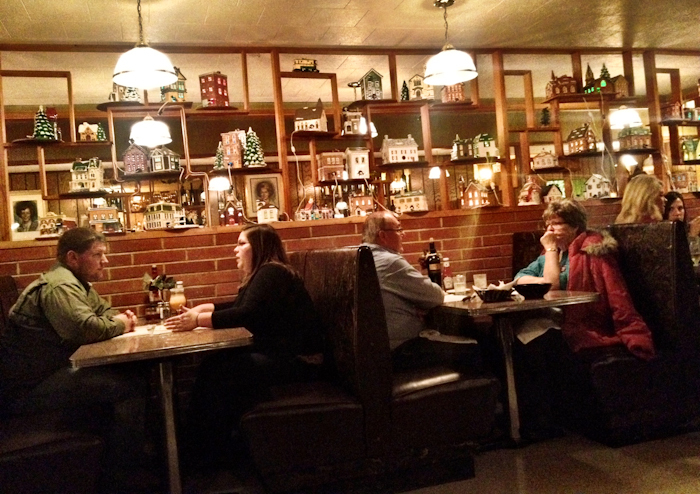 Who Knew that Le Mars, Iowa had the Best Steakhouse in the Country? 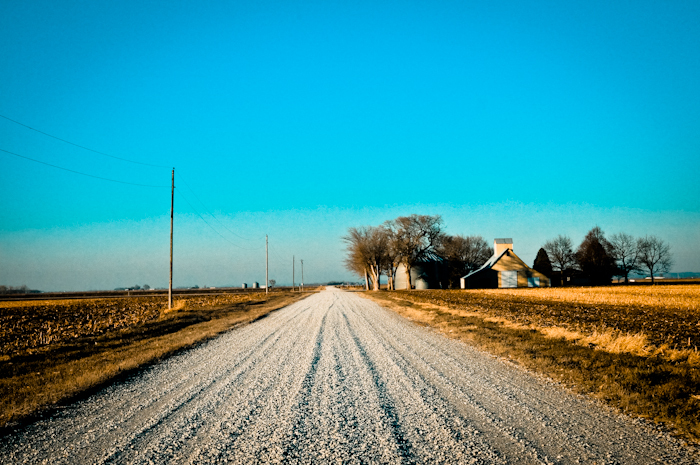 Yesterday we drove from Kansas City to a little town called Le Mars, Iowa, just a ways past Sioux City. I chose this town because it was (1) the right amount of driving hours down the road from where we started and (2) they had a county park campground that didn't say on its website or in the All Stays app that it closed on October 1, October 31, or November 1 like most of the other campgrounds I was finding. 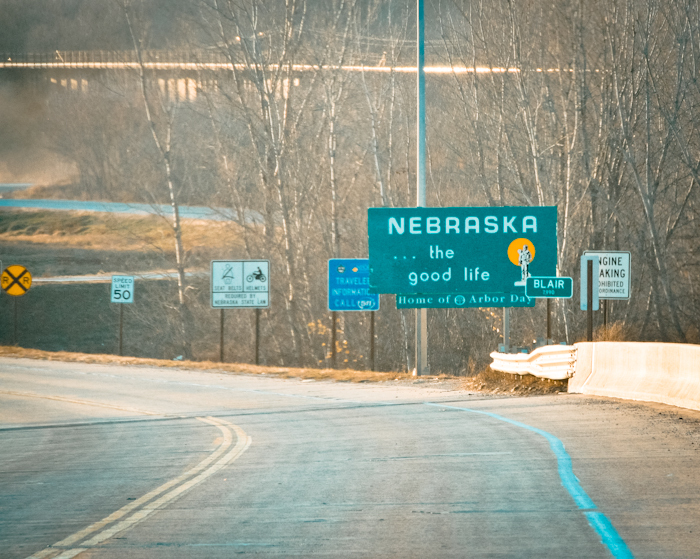 We took a short detour into Nebraska (so we could add the state sticker) and headed over to the DeSoto National Wildlife Refuge just on the other side of the Missouri River. 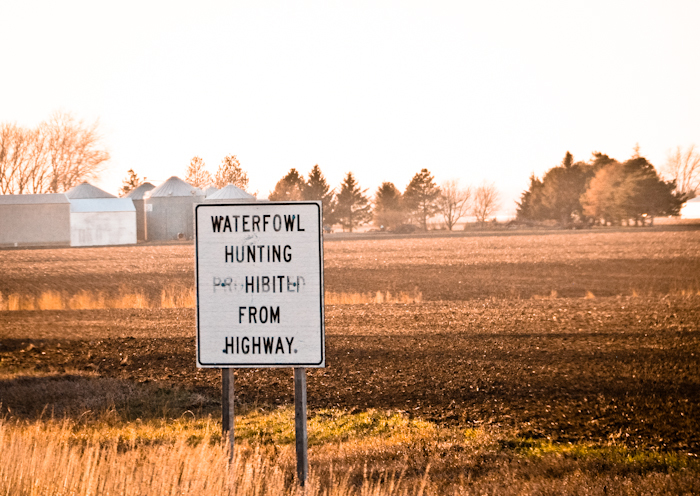 We passed one of these signs on the way (there were quite a few of 'em) and Kevin said "Okay Cletus, you drive an' I'll shoot, then on the way back, I'll drive an' you can shoot!" Turns out not only the campground at the DeSoto National Wildlife Refuge was closed, but the whole place was closed. We found this out when we reached the end of our little road and both entrances had gates and both gates were closed. This meant we were going to have to turn around. Um. Hm. Oh, and there was a school bus down at the end of this same road too. So we had to turn around, at the end of a street, with steep ditches on either side of the road, with a school bus partially blocking our way. Hm. Kevin got out and guided me and we managed it, but we still weren't in Nebraska. Kevin got out the map (iPad) and navigated me to Blair, which was in Nebraska. Check. 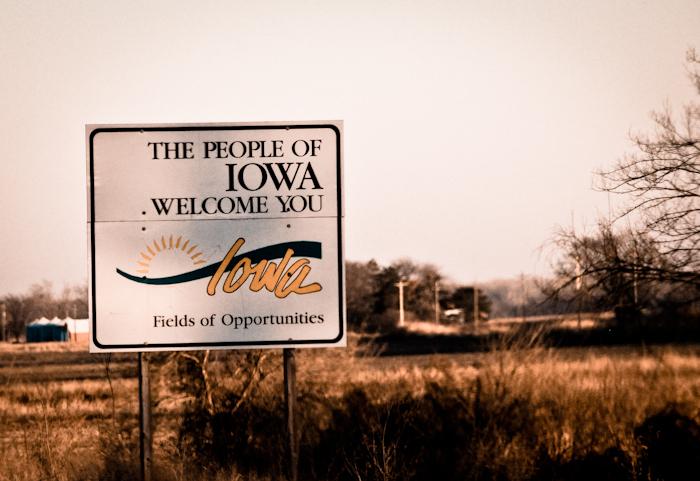 We were almost to Sioux City and it was 5pm. 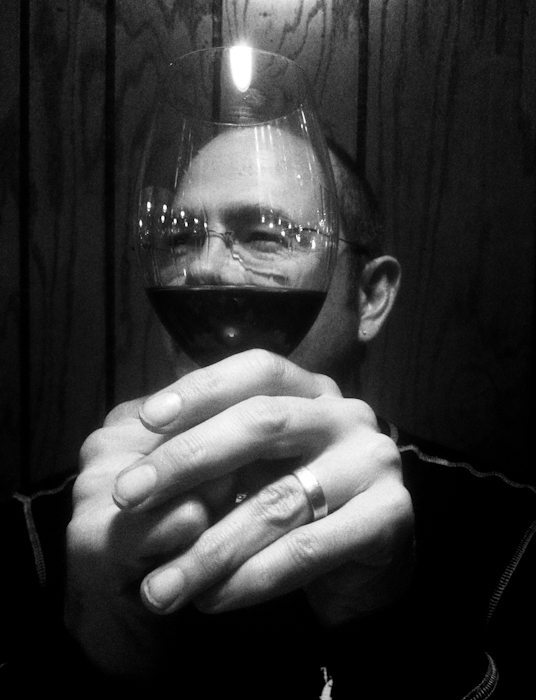 I wondered out loud if there was going to be some place for us to grab dinner in Le Mars, Iowa and Kevin pulled up Yelp to find out. What he found was Archie's Waeside. I don't even know how to begin to describe this place. The Yelp reviews are awesome though, and we determined that this was indeed our dinner spot. How anyone can give this place less than 5 stars is remarkable. 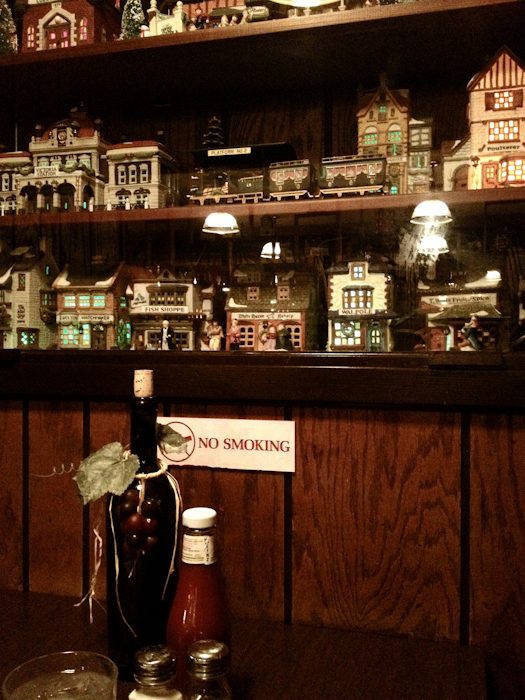 Awesome steaks in a totally 1970s retro environment. NW Iowans probably don't use Yelp very often, but some of you out of towners might be driving through looking for a great place to eat. 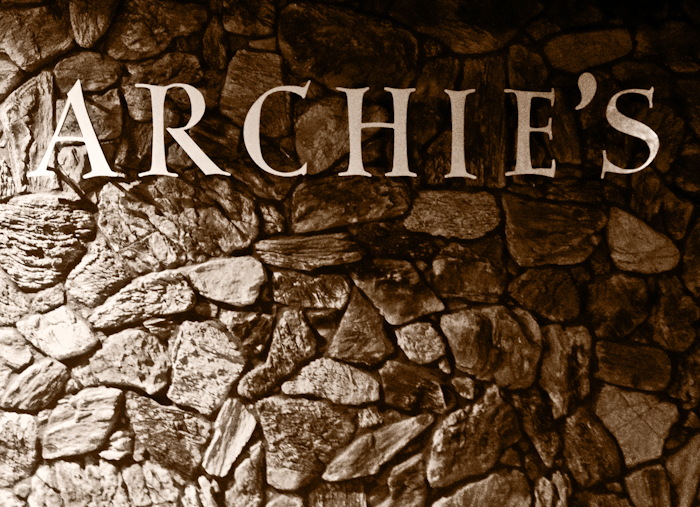 Archie's is a gustatory and cultural landmark in Le Mars. 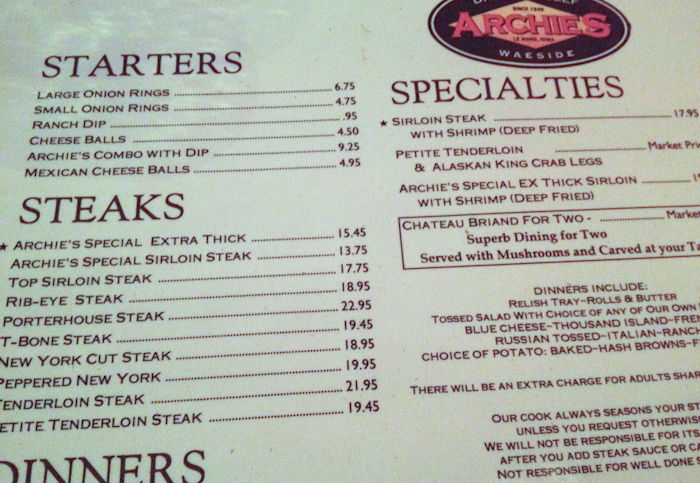 Proposed Archie's Motto: "The steaks are so good that nothing else matters." We arrived in Le Mars after it was dark and headed to the campground at the county park. We figured we'd unhook and then head over to Archie's. The park looked great, but alas, more closed gates (chains, padlock). Ok well, let's just see if we can find a place to park near Archie's and we'll just go spend the night at Walmart after dinner. We found Archie's (no signage on the street at all, but many cars going in and out of a very large parking lot) and parked in a nice big field across the street. I tried so hard to get photos that would describe this place, but I failed. It wasn't just that I was using my iPhone in low light…you just have to BE there to feel the full effect of all that paneling, rock walls, 70s brown/gold chandeliers (mixed with the overhead flourescent lighting), big brown booths, walls and walls of cheery china knicknacks…it was fabulous. I had the petite tenderloin and Kevin had the regular tenderloin. It was indeed one of the best steaks I've ever had. I usually never order a steak in restaurants because I'm always disppointed. The tenderloin that Kevin makes once a month or so at home is the best steak I've ever had. This one here at Archie's was, well, excellent. Almost as good as the one Kevin makes at home. 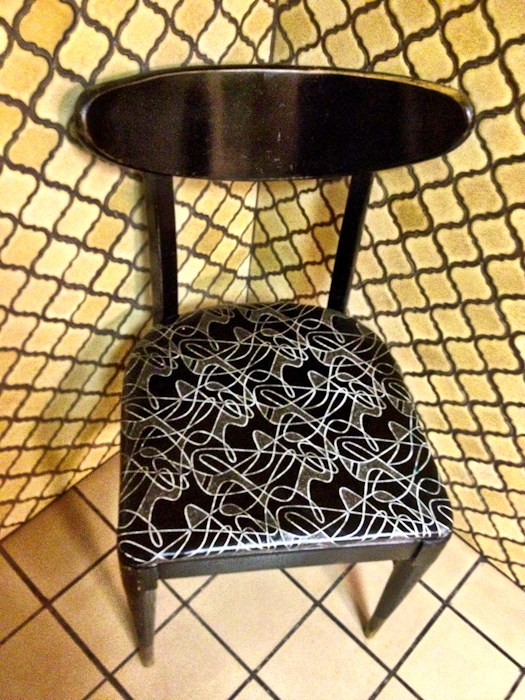 And check out this amazing chair in the women's restroom. Don't you want it? Now we're in the Walmart parking lot and we just made some coffee and some breakfast and we're going to head over to Arnold Motor Supply in Le Mars to pick up some Traeger pellets (so we can cook our Thanksgiving dinner next week — probably from somewhere in the Badlands — without running out of pellets). Then we're heading East…after we take a quick dip into Minnesota…cuz, you know…we need another sticker. Next Post We’re in the Badlands!